Let’s face it. IT security is boring. So boring, that I almost hate to discuss it in a blog post! But wait… don’t stop reading! IT security is boring, but so is banking and paying the bills. You can’t ignore paying your bills any more than you should ignore IT security. When I talk about IT security, I mean keeping your information on your servers, your PCs and laptops, all of your devices safe and secure from unauthorized use. I believe a managed approach to IT support is the only effective way to insure that you are taking the steps needed to prevent information theft. 1. I haven’t had a problem yet (so the danger must not be real) – This logic almost never works, and it, definitely, does not fit for IT security. The danger is very real. Nearly every virus, spyware, and bot out there is designed to steal information, or harness your computer to steal information from others. The bad viruses are the ones that go undetected and eventually share things like credit card numbers, bank account credentials, and even personal identity information. 2. My company doesn’t really have any information to steal – Every piece of personal information is a target from social security numbers to credit cards, to bank accounts. If you really have none of this information, the hackers will hack your computers, and then use them to SPAM and to break into other systems. 3. Only larger companies with trade secrets or big pockets are a target – There are articles that appear daily in the Wall Street Journal and other trade publications that clearly state otherwise. The size or notoriety of your company does not matter. Most hackers break into systems and PCs using an automated bot or virus. The bot does not care who you are. It takes any available opening to infect a machine and begin to search it for information. 4. Information theft is just not that big of a deal – Information theft is the largest organized crime in the world. It is over a 1 trillion dollar a year business. There is a black market for information that is quick and easily accessible. Hackers are organized, well paid, incentivized and active. Many hacking organizations have the sophistication of a professional business. What does information security have to do with being proactive and actively managing IT? Everything really. Times have changed, and it is important to make sure you are taking the right steps, which is reason#1 – Why managed IT support makes sense. And Reason #2 – Your business depends on it! To keep your network safe and secure from hackers, bots and malicious attacks, I recommend implementing a disciplined, systematic process. This includes applying security patches at least twice weekly, reviewing logs, monitoring critical services, and insuring that your security systems are active and up-to-date. This takes the right tools, the right discipline, and the right people. There is an epidemic of information theft. 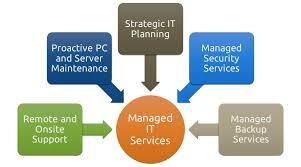 It is time for your organization to protect itself with a proactive, managed services IT plan.